When I first got into spinning, I had romantic notions about raising my own sheep and alpacas, with the occasional angora goat — a fleece flock I called it. That was before I spent some time with friends who actually raise sheep. It’s not a money maker — it is a labour of love. Animals need a lot of attention and the time you spend on them is time you can’t spend spinning and doing fibre preparation. So in my development as a fibre artist I decided that I would do all I could to support those who are raising these fantastic animals — especially those who are doing it as small scale farmers. For as much as my crafts of spinning and fibre preparation need to be continued into the next generation or we’ll lose them, so too is the art of animal husbandry. The art and craft of taking care of domestic animals. They don’t take care of themselves. They need a lot of looking after for a healthy and stress free animal provides the best kind of fibre — and meat. Sorry to the vegetarians, but it’s a fact. Here is some fibre from Humming Fee Farm that I purchased this weekend for the workshops. I bought 4 1/2 lbs of lovely corriedale and 1/2 lb of yearling mohair. I’ve spent the morning portioning the mohair into bags and making the wool into braids. The braids on the right are 50 g braids and the bags in the plastic box each contain 15 g of the yearling mohair. 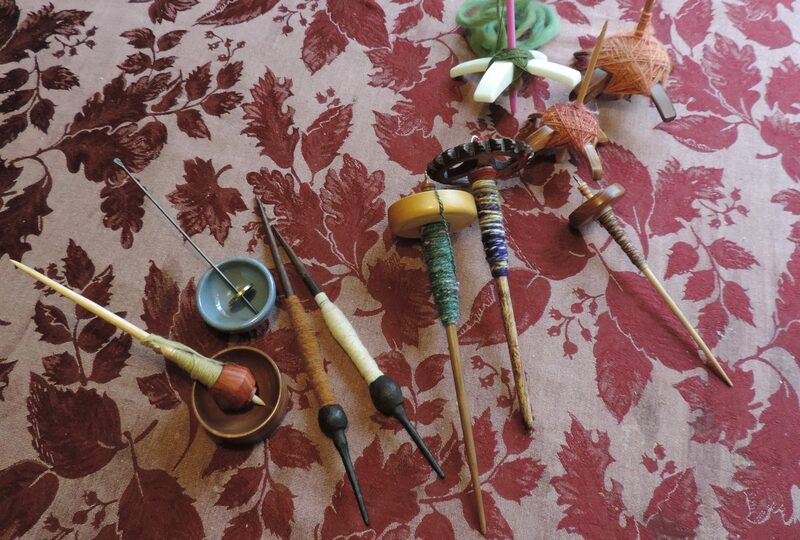 The corriedale will be used in both the Beginning Spindling and Advanced Spindling workshops. The mohair is for fibre blending in the Advanced workshop. There are many more fibres to gather and prepare (alpaca, silk and other kinds of wool) but this is the start. And a grand one it is thanks to Devon and her family. This entry was posted in corriedale, Humming Bee Farm, local fibre, mohair on March 18, 2012 by DianaTwiss. I started with a pile of wool of various colours. Pinks, burgundys and some natural brown. Blended that together and made two good sized batts. It’s the dark coloured batt at the top of the picture below. I had two good sized batts of cream coloured alpaca in my stash along with a batt of pink and purple mohair. Divided the wool, alpaca and mohair into six equal parts that I would blend. All this fibre is locally sourced. I put the fibres through the drum carder in layers. On the second pass through the carder, I pulled fibre off the end of the batt so I would have a chunk the length of the staple. I put these clumps through the drum carder sideways. This makes the fibres blend quickly and evenly. The final pass through the drum carder is done to straighten out the fibres and blend them one final time. This is batt #6 coming off the drum carder. I have six of these batts for a total of 1/2 pound of blended fibre. That was time well spent. This entry was posted in alpaca, blending fibre, drum carding, local fibre, mohair, wool on February 19, 2012 by DianaTwiss.